Staying properly hydrated is a challenge for most folks on a normal day. We could all stand to drink more water. For runners, this challenge is even more important. Lack of proper hydration during runs lasting more than 45 minutes will result in a slower pace, discomfort, and generally poor performance. Of course, it’s not always easy to get water during long runs, unless you are carrying it with you. This is where the newer running water bottles come in very handy. Gone are the days of trying to grip a condensation-clicked water bottle in your hand while you run. The latest generation of handheld running water bottles has come a long way in terms of usability and convenience. These bottles usually carry 10-20 oz, plenty of water for a medium to long run. For longer runs, we would suggest a hydration belt or pack. The newest handheld water bottles are also offered in a soft flask. This makes them easier to carry and collapse down for storage when empty. There are a number of great options to choose from. This can be both exciting and a bit overwhelming. 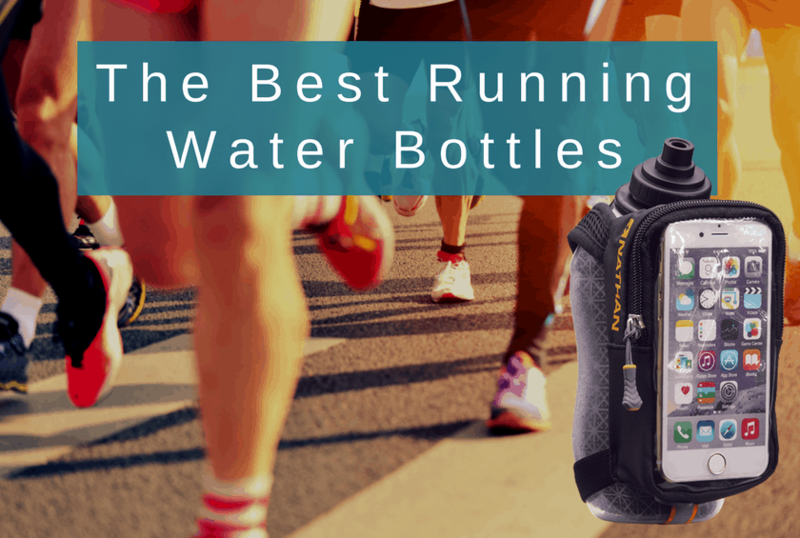 To help you out, we have compiled this list of 10 running water bottles that are best when it comes to convenience, comfort, and usability. As the name implies, this running water bottle from Ultimate Direction allows you to get the water you need quickly. The Fastdraw 600 is ergonomically designed for comfort and convenience. The shape of the bottle makes it easier to angle the nozzle into your mouth for quick sips on the run. The Fastdraw 600 also features a new, wider hand strap that fits snugly over your hand. You’ll experience less bounce and chafing during your long runs. If you need to carry your phone, this bottle has you covered. It is iPhone 7-compatible with its zippered nylon pocket. It also features a stretch mesh storage pocket to hold those much-needed gels. The Ergo Lite handheld running water bottle is packed with features. It is fully insulated to keep your water cold on long runs. It can also keep drinks warm if necessary. The ergonomically shaped bottle features a Jett Squeeze cap that delivers hydration quickly and easily while you are running at a good pace. This precision valve allows quick access to water without pulling on the cap. 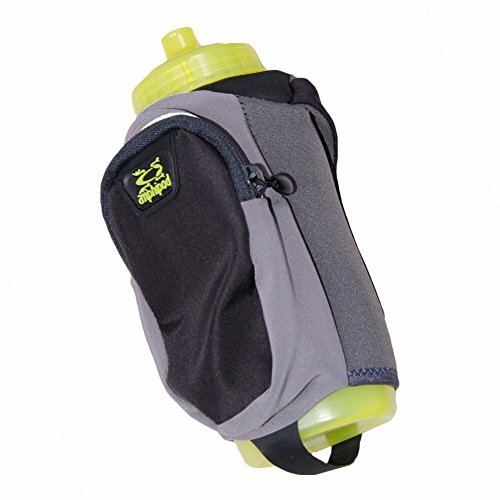 The sleeve is designed with a Thumb Lock grip so that you don’t have to actively grip the bottle while you are running. To eliminate chafing, the Ergo Lite has an adjustable strap that is cushioned for a comfortably snug fit. You can also tuck your large-size cell phones in the expandable zippered pocket. There is plenty of room to carry your keys, phone, and gels for those longer runs. Can feel heavy in your hand when fully loaded with water, keys, etc. Nathan Sports offers the SpeedDraw plus for quick and easy sipping while out on your run. The insulated flask will keep your drinks cold for the duration of your work out. The water bottle holds an ample 18 ounces of liquid to help you push through those longer excursions. The large zippered pouch can hold today’s bigger cell phones, along with your keys and ID. There is also plenty of room to add gels and small snacks, great when you are out running for a long time. The hand strap is fully adjustable, which allows you to customize the fit on your hand. There is a convenient thumb hole that allows you to carry the bottle grip-free, as well. When you are ready for a sip of water, you can take a grip and use the easy-squeeze bottle for quick hydration without slowing down. If you need access to your phone during your run to listen to music or monitor apps, then the Speed View Plus from Nathan Sports is a great choice. The carrying case offers a versatile smartphone carrier so you can see and use your phone while on the move. The phone is held securely and protected from sweat and the elements. The pouch can fit cell phones up to iPhone 7 size. It also has a convenient audio jack so that you can plug your headphones into it. 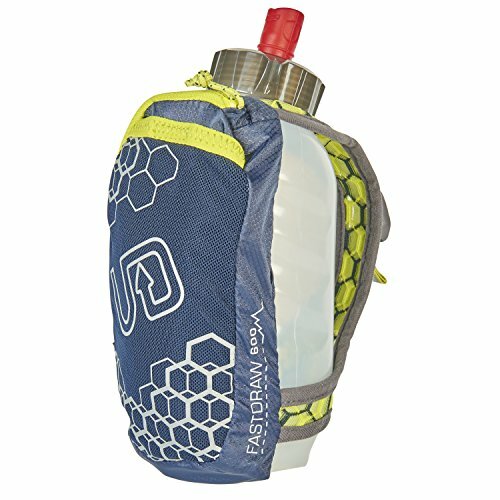 The flask is also insulated to keep your drinks cold during longer runs. With double walled insulation, it can keep your drinks cold for up to 20% longer. The handheld bottle holds up to 18 ounces of refreshment. 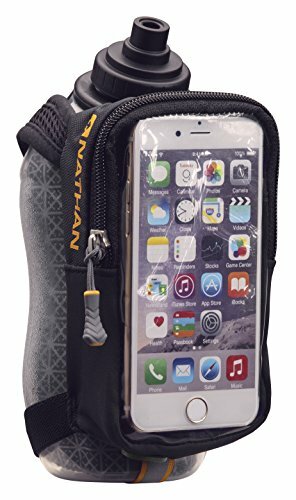 The Nathan Sports Exoshot Handheld is designed for the runner who just needs hydration without the need to carry a lot of items. There are expandable stash pockets to hold smaller items, such as gels and keys, but not room for much else. The ergonomically designed hand strap is designed to have the bottle feel natural in your hand. It lets you carry the bottle without actively having to grip it. And with the patented ExoSpine, you will get a comfortable grip on the bottle with ample support for the flask. This handheld bottle can also be used for multiple purposes. 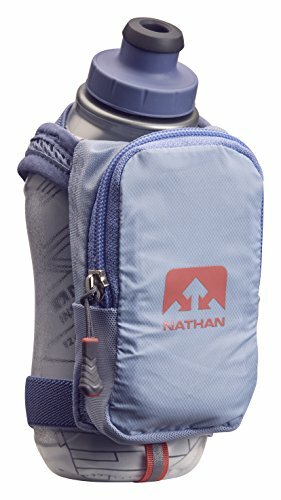 Simply remove the hand strap and you can use the ExoShot flask with your Nathan hydration vest. 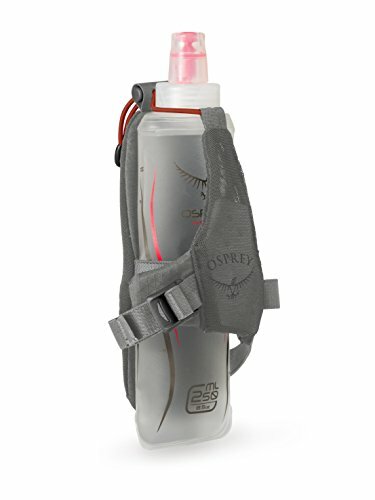 If you are looking to carry your water and precious little else, then check out the Duro Hand water bottle from Osprey. It is designed with the minimalist in mind. It features an ambidextrous design with a comfortable grip that fits easily in either hand. The Duro Hand is also built for speed. If you will be kicking it into high gear during your runs, you will be safe knowing the grip is bounce free. This will allow you to stay hydrated while maintaining a solid pace. If you need to store some gels or other small items, there are pockets up front. They are designed to provide quick and convenient access while you are on the move. No more stopping or slowing down to fish out a much-needed gel from an oversized pocket. The Ultra Handheld from Camelbak is the first in our list to feature a collapsible bottle. The design of the Ultra focuses on the bottle being soft, so that it molds to the shape of your hand. This will provide a secure fit that feels natural while you are running. To keep your water colder longer, the flask is insulated. The three-dimensional mesh material allows the handheld to be breathable. This will keep your hand from overheating while carrying it. There is a zippered storage pocket to hold your phone, ID, and keys. There is also a stretch pocket to store gels and other small items. The secure elastic strap will prevent you from accidentally dropping it while you are running. With an excellent combination of functionality and style, the Clutch water bottle from Ultimate Direction is a fashionable and functional choice for your running kit. Designed specifically for women, the soft and breathable AirWall Mesh makes this comfortable to hold and convenient to use. The Clutch is designed with two hook-and-loop closures that allow you to size the grip to meet the exact size of your hand. This will give you a snug fit that reduces bounce and eliminates chafing. There is a zippered pocket on the front to securely carry items. While it is not large enough for a phone, it can carry a number of essential items for your run. 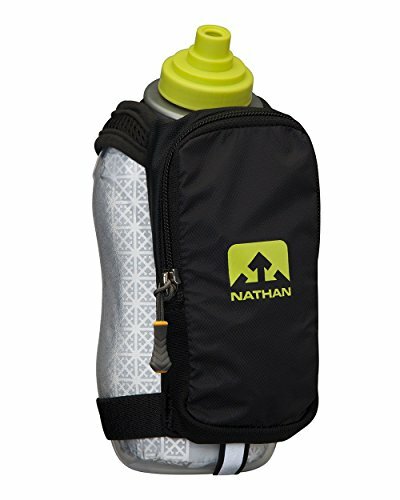 Nathan Sports makes yet another appearance on our list with Speedshot Plus Insulated Flask. This insulated handheld with double-wall flask construction can keep your liquids cooler for up to 20% longer. This comes in handy, especially for those longer runs. The Speedshot Plus also features a no-slip grip insert. This makes carrying the handheld bottle easier on your grip. There is also a thumb hole that easily enables grip-free carrying. The flask can hold up to 12 ounces, and has a trademark Push-Pull Blast Valve cap for quick sips on the go. The Amphipod Hydraform is a super-low-profile model that has a unique look and feel. A full 40% lower profile as compared to other models, the Hydraform has a fully adjustable, chafe-free hand strap for comfort and convenience. The uniquely shaped Amphipod bottle is BPA free. This means your water will be safer and fresher for those long training runs. The bottle is available in 12- and 20-ounce sizes. The minimalist strap is designed to be free from slips. It is also easily adjustable to fit comfortably in your hand. 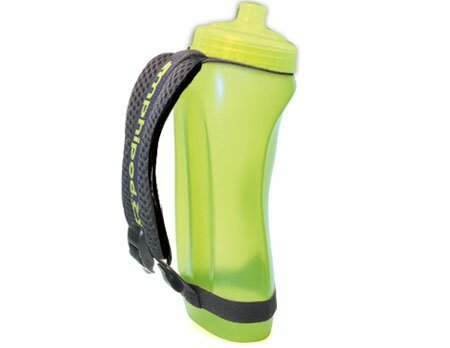 If you are looking for a comfortable bottle with no need to carry other items, then the Amphipod Hydraform is a solid choice. As we all know, it’s important to stay hydrated while we’re running. A good rule of thumb is to drink 4-6 ounces of fluid every 20 minutes during your run, and 6-8 ounces if you’re running faster than an 8-minute mile. It’s important to find a running water bottle that is going to meet your needs and give you the hydration you need! If you’re looking for a basic water bottle, a hard bottle may be just fine. They are great for short runs if you decide to carry them, and long runs if you need a lot of hydration. You’ll get plenty of water with a hard bottle, and at a fairly inexpensive cost. Plus, you have a variety of options, from fancier bottles that are molded to fit the curve of your hand, or (if you’re a female!) sports bras that allow you to stash normal-sized water bottles between your shoulder blades. By contrast, if you hate the noise of sloshing water or find hard bottles to be too bulky, you might want to consider a soft flask. They are more comfortable and pack down for storage, but they hold less water while being more expensive. Many trail runners, however, prefer soft flasks, noting that they slosh less, have a nice, easy-flowing, soft rubber valve, and condense as they empty. They make less noise as the soft sides collapse in when the volume of liquid decreases. Other runners note the ease of use of a soft flask, plus the fact that you don’t have a bulky bottle digging into your ribs or collar bones. You just have to bite the valve on the soft flask, and you’re hydrating. An insulated bottle is likely going to be the better option for you as a runner, because it will keep your water nice and cold. Plus, it will not sweat, as the outside of the insulated bottle does not get cold enough to allow the water vapor in the air to condense. In sum, insulated bottles are particularly handy on hot days: the water stays cold, and the bottle stays dry. If keeping your water cold is not as much of a concern, a non-insulated bottle will be the cheaper option. Non-insulated bottles can be great everyday carry options, and you can get them in extremely light versions. Thus, if you don’t need anything fancy, a non-insulated bottle could be a good choice for you. Only hard bottles come insulated. Soft flasks aren’t insulated, unless you buy a model where the bottle sits in an insulated sleeve. When choosing a water bottle for running, you need to know what your needs are. If you’re planning to run longer distances, you likely will want to consider the capacity more than the weight. You might opt for a larger water bottle, waist belt to carry several, or hydration vest so that you have the liquids that you need. On the other hand, if you’re more interested in speed – or you aren’t running too far – and don’t need as much water capacity, weight is going to be a more important concern for you. Something light will be better than something large. Bigger bottles will obviously hold more water, but they weigh more and are harder to carry. Does the strap allow for different ways to hold the bottle? It’s important that you can stay comfortable as you run. Thus, if you are interested in a handheld bottle with a strap, you should see if it can be held comfortably in several different ways. This way you can adjust as needed during your run. If you need some extra space to store your keys, gels, money, or phone, you should see if the water bottle has a pouch or pocket for storage. Some bottles have a small pocket that allow you to store additional items in case you don’t have available pockets in your shorts or leggings. Remember to keep in mind, though, that anything in the pockets will add weight, which is especially pertinent if it is a handheld bottle. You should also check to see if the pocket is zippered or Velcroed. You might feel safer with something that can zip, as opposed to Velcro, if you’re placing keys or money in that pocket, but it might not be as necessary for extra gels, for example. When deciding if you are going to select a pull valve versus a bite valve, you should remember that bite valves are generally better as they leak less. But they are also less user-friendly at first. It can take a little while to get used to a bite valve. In the long run, however, they are extremely simple to use, especially with a hydration vest, as you do not have to fumble with a bottle. Pull valves are what you find on classic water bottles (like a bike bottle). The problem is, if you forget to push the top back in, it will leak all over the place.